Hi, and welcome to a new year of Mythbusting! We’re going to start out the year off with a myth about the character of the District. When I first moved to DC, I always thought it was such an international city– walking down the street, you hear people speaking foreign languages, and with all the embassies it seemed like it was home to people from many different nations. And I’m not alone– there are clubs in the city focused on bringing international professionals together, and DC is known as a major global city. But is the District home to more people from foreign countries, and more foreign speaker, than other peer cities? According to available Census data, not really. About 12.8% of the District’s population was born in a foreign country, compared to 12.5% nationally– so no big difference there. And only 14.6% of District residents speak a language other than English at home, which is significantly smaller than the 19.6% of US residents that do so. So in these two measures, the District certainly doesn’t stand out as having more international residents than the US. But, we know that comparing DC to states or countries isn’t usually a good comparison because of the unique characteristics of a city. So let’s compare the District with peer cities, like Baltimore, Boston, San Francisco, and Portland. DC is definitely on the low end of peer cities, according to 2006-2008 Census estimates. 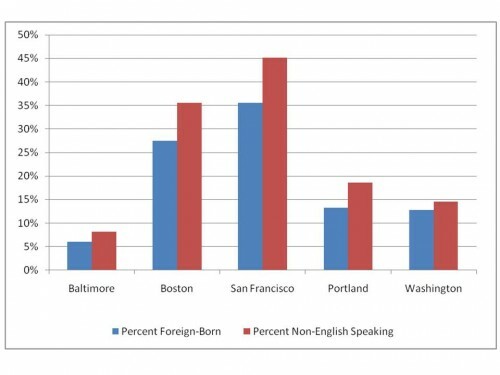 Of course cities like Boston and San Francisco, which are typically more associated with immigrants, have higher proportions of foreign-born residents and non-English speakers. But even Portland, which is not considered a global city, has higher percentages of foreign residents than the District. So using Census data to answer this question shows us that DC residents aren’t any more international than the next city. Here’s where the international character of DC starts to come out. When you look at the region, the DC area does have a higher proportion of foreign residents than the national average. It’s still dwarfed by San Francisco, but it’s home to more foreign residents and speakers than Boston. So I guess all the people that I hear speaking foreign languages just commute in from the ‘burbs? DC definitely has an international character, with all the embassies and international organizations here. But when you look at who is living in the city, it doesn’t have the high proportion of foreign residents that you’d expect. And even when you factor in the suburbs, DC still only comes in a bit higher than the national average (though above many peer cities). So what’s the verdict? 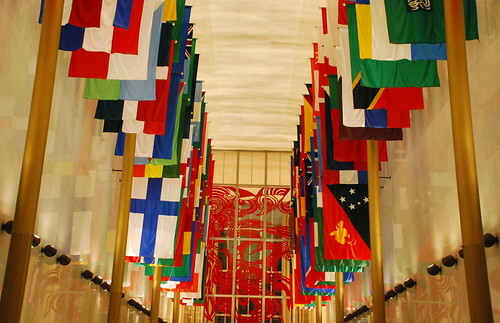 DC is an international city, because of the federal government and embassies and organizations based here. 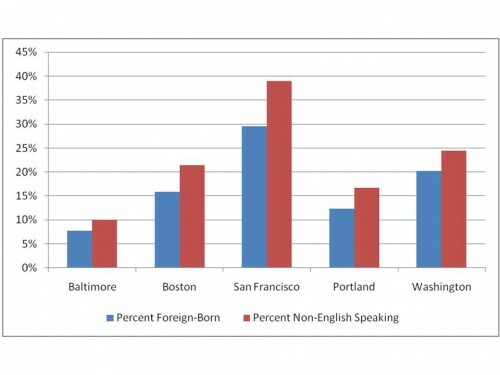 But DC residents aren’t more foreign-born or foreign-speaking than normal. Our region has a higher percentage of foriegn-born and foreign-speaking residents than many other peer cities, but it’s still not near the level of San Francisco, for example. So while the city is international, those who live here aren’t overwhelmingly international. Myth both busted and confirmed. And, while I’ve got your attention! Census information is important to statistics nerds like me, but it also determines how much money DC gets for various programs. So I’m putting in a plug for DC Counts– please fill out and return your 2010 Census form. Whether you’re a citizen or not (and if you’re here illegally you should still fill it out because your immigration status will not be shared with law enforcement), it’s your responsibility to fill out the form. We need an accurate count of who is actually living in the District, so please fill out your 2010 Census. The point being, when I think of an international city, I’m not thinking of a city with a high percentage of people from other nations, but a wide variety of noticeable communities from other nations… don’t know how to measure something like that, though I suppose you are the statistics nerd… maybe something like the number of communities of 5000 or more people who are from another country within the metro area of these cities? Aaron has got it. What your analysis misses is the DIVERSITY of foreigners we have here in Washington. You might be more likely to see a Cuban in Miami than any foreign-born person in DC, but you’re more likely to hear 10 different languages in one day in DC. Thanks for your comments! I wish there was a way to easily compile and compare country of origin across multiple regions, but unfortunately the way the Census data is set up, it’s not easy to do. And the closest thing that ACS data provides is “Ancestry”, which has nothing to do with foreign-born status or language spoken at home (for example, my ancestry is Irish even though I’ve never lived there and don’t speak Gaelic). In an effort to easily compare straight percentages of international residents across metropolitan areas, I had to stick with the easily measurable statistics. If anyone can provide a better way for me to measure the diversity of foreign-born and foreign-speaking residents in the DC region, I’m all ears! I’m curious about the diversity aspect as well. I bet DC has a lot more mixing of the international folks than other big cities, too–I don’t have to go to Chinatown or Little Ethiopia to encounter a Chinese or Ethiopian person. Don’t know how you’d measure that, though. I’d like to echo Arlington Aaron’s and the others thoughts. DC has great five continent diversity. Interesting, FWIW fact not widely known. The biggest minority in Fairfax Country is Asian. I love DC for all its diversity. Just the other day we learned about a highly touted Bosnian restaurant south of Alexandria (Cosmopolitan Grill), and we plan to go this weekend. Is there a good Asian grocery store in Chinatown or anywhere in DC? There are tons of great Asian grocers in Fairfax County. Not sure about the District. Our region’s actually functional Chinatown (actually it’s a Koreatown) is Annandale. One point in D.C.’s favor on the international issue: what with all of the embassies in Washington, it’s likely to be the place on Earth with the most international territory concentrated in one place. 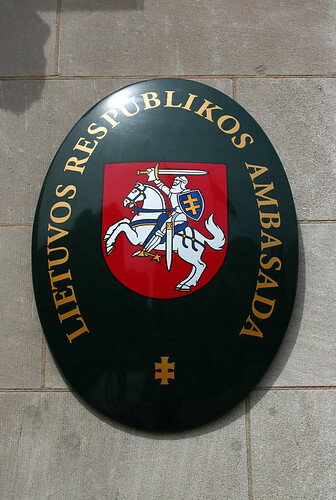 Consider, for a moment, that the sovereign territory of some 100 (?) countries are within our fair city’s borders. I always thought that was pretty cool.